Chronic liver disease (CLD) and its attendant increased risk of operative mortality and morbidity give appropriate pause to many surgeons and patients prior to undertaking any operation, especially an emergency. 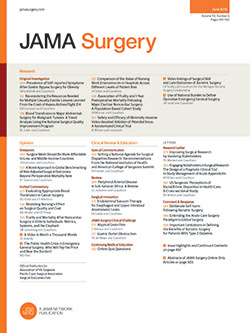 While the American College of Surgeons National Surgical Quality Improvement Project Surgical Risk Calculator1 does not yet incorporate liver disease–specific measures, multiple previous studies have demonstrated the importance of prognostic factors such as Child-Turcotte-Pugh score, serum creatinine level, international normalized ratio, cardiopulmonary comorbidities, and American Society of Anesthesiologists physical status class.2 Advances in the medical care of patients with CLD and improved outcomes in liver transplantation have made long-term survival in patients who would not otherwise be considered for major surgery quite possible. For these reasons, accurate prognostic models of survival in cirrhotic patients are useful to clinicians.